Every grower has slight to significant variations in approach. 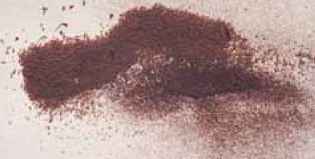 These range from sowing spores on expanded peat pellets which are pretreated with boiling water, a popular method especially for limited production, to dusting spores on moist clay pots, to assorted modifications of the method described below. If you are successfully propagating, skip on to the next chapter. A close look at developing spores ripening from the lower portion of the frond upwards and from the rachis towards the outer edges. Spores are past maturity in the brown areas and ripe for picking in the black. Most garden spores mature, depending on your climate and the species, between late spring and midau-tumn, with the adiantums being among the last. (Ono-clea sensibilis, matteuccias, and some woodwardias are among the exceptions. They produce their spores in fall and release them the following spring.) With practice, sometimes painful, the grower can chose a frond at the optimum time for collection. If an indusium is present, it will lift and expose the shiny spores. If the indusium is firmly attached, the spores are immature. If the indu-sium is shaggy-looking, the spores may be past maturity and already dispersed. It will then be best to wait for a freshly fertile frond—perhaps even from a future year's crop. (For live action, place a pinna with the presumed ripe spores under the light of a microscope. If they are indeed mature and ready for dispersal, the heat from the lamp will induce the spores to be jettisoned about in nature's way of distribution.) Otherwise, for collecting purposes, pick a promising pinna, cleanse it with a quick wash and dry, and place it between a folded sheet of white paper. If ripe the spores should drop within 24 hours and will leave a signature pattern on the paper. Frequently chaff (sporangial detritus) will drop as well, and this must be removed before sowing. To get rid of the chaff, which frequently carries seeds of trouble in the form of fungus, algae, or mold spores, tilt the paper slightly and tap gently. The chaff will fall away while the spores remain behind. This can be disconcerting on the first try (especially if the sample is made up entirely of chaff), so practice with noncritical ferns to gain confidence. Once cleaned the spores are now ready for sowing. I find it best to sow the spores when fresh. With osmundas and other species that have short-lived, green spores, it is essential to sow immediately. They are viable for about three weeks, although freezer storage prolongs their viability. (Spores of any ferns that will not be used immediately benefit from refrigeration.) Blechnums, while most are not of the green variety, can be temperamental subjects and are most likely to produce a successful crop when promptly sown. For beginners and those eager for instant gratification, I recommend starting with almost any Dry-opteris as they consistently germinate with ease. I do make a seasonally induced exception for deciduous material. Ideally they are best sown in a time frame that enables them to mature and progress to the out-of-doors (and dormancy) by mid to late summer. This takes trial and quite a bit of error to determine the ideal timing. I use rigid, clear plastic containers, approximately 4 by 5 by 2-1/2 in. high (10 by 13 by 6 cm), which I recycle and sterilize by running through the dishwasher, on the top shelf away from the heating element. Containers that can be firmly sealed, such as from the salad bar of the local grocery store, are an inexpensive option, but are not to be treated to a meltdown in the dishwasher. For a medium, and here is where there are multitudes of options, I use a commercially packaged earthworm compost that is primarily a mixture of humus with some peat and a little perlite. I place this in a lasagna-type pan and pasteurize it by lightly moistening but not soaking the soil. It should not be muddy. 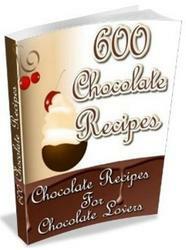 I cover it, but do not seal it, with foil and bake at 175°F (64°C) for three hours. Hotter temperatures destroy the good as well as the bad in the soil mix. Be advised that the heated medium gives off an earthy fragrance and can scare off dinner guests. Other growers use their microwaves for sterilization; however, since there are so many variables, I cannot safely give a formula. Finally, for a simpler procedure, pour boiling water through the soil, being certain to "cook" the entire batch and noting that it may take some stirring and several immersions to sterilize thoroughly. Once the medium has cooled, I place a 3/4-in. (2-cm) layer of moist soil in clean containers and proceed to dust the spores on the surface. To prevent contamination when doing more than one culture, I start with the packets that have the least amount of material and I also do each sowing in a different room in the house. I put a label both inside the container and on the outside as well. I place the containers on the shelves in the plant room approximately 12 in. (30 cm) under cool white, 40-watt fluorescent lights that are turned on for 14 hours a day. Fancy or expensive light tubes are not required. Throughout the entire procedure the cultures must be out of direct sunlight, although indirect light such as from a north window is fine. Commercial growers leave lights on longer, sometimes up to 24 hours a day, and replace bulbs frequently to produce a maximum output of consistent light. In addition, their controlled temperatures maintained at 65 to 70°F (18 to 20°C) are clearly beneficial but not necessarily practical for the home grower, especially those of us who keep our thermostats at or below 62°F (17°C). I must confess, however, that the professionals routinely produce an admirably uniform and attractive finished product far more efficiently than any of the amateur growers. Spore and chaff drop from Arachniodes aristata 'Okoze'. Dark spores are separated from under a blanket of tan chaff. In time, perhaps as soon as several weeks, a thin green haze will form on the culture. This will expand into a carpet of prothalli (looking like miniature liverworts). When prothalli approach Vi in. (6 mm) approximately, they should be lightly misted to encourage fertilization. Beware of overcrowding as the sperms, but not the eggs, will develop and fertilization will consequently not be possible. If this appears to be a problem, thin the population by lifting tidbits of prothalli and transplanting them into another container. Meanwhile, if no little sporelings appear after several additional weeks, and the culture has a uniform distribution of prothalli, spritz again. Some growers recommend using distilled water, but I have found normal tap water, which has settled overnight to release the chlorine, to be just fine. An exception would be if the local water is naturally limey in which case it could kill or at least curtail growth on acid-loving species, especially blechnums. I then move small clumps, not individuals, of prothalli-sporelings to 72-celled trays in a covered mini greenhouse in a mix of peat, vermiculite, washed grit, and composted potting soil. These too are under fluorescent lighting where they are grown on until they are above 1 in. (2.5 cm) tall. At that time I harden them off by gradually lifting the lid of the pseudo-greenhouse. 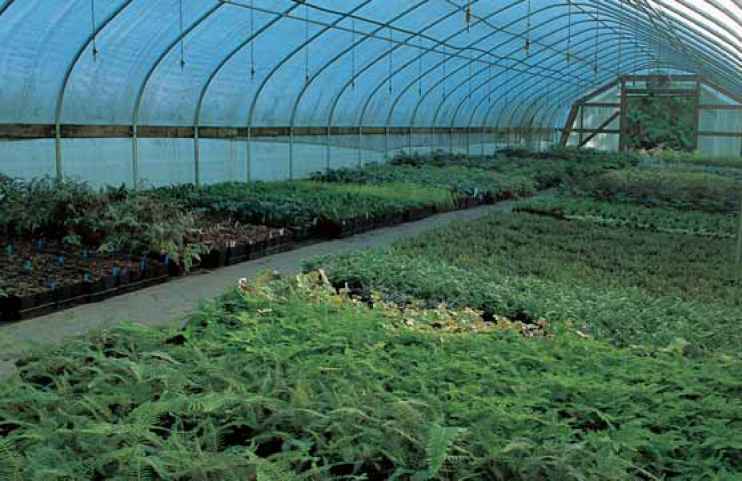 Wholesale commercial production of spore-grown ferns at Henry's Plant Farm. The sporelings are then transplanted into pots with a soil mix of compost, peat, and well-washed pumice (extremely important for removing the fines that are chalklike and can plug the vital oxygen pockets in the soil). Do not be tempted to overpot as the soil that is not quickly penetrated with roots will drain poorly and sour in short order, a potentially devastating threat to the ongoing health of the young fern. A 4-in. (10-cm) pot provides ideal room for rooting without the danger of over potting. When the fronds reach 4 to 6 in. (10 to 15 cm), the pots are ready to be transferred out to a cool lath or shade house, depending, of course, on the season. Elapsed time can be from 8 to 12 to 24 months or longer. Temperate polypodiums, pyrrosias, and their close relatives can take several years of nurturing before they develop and fill a small pot. Once beyond their prolonged infancy, however, all will behave and grow with the vigor associated with their hardy brethren. Young sporelings of Dryopteris sieboldiiin 72-cell trays. Ferns in the finishing stages of production at Sundquist Nursery, Poulsbo, Washington. 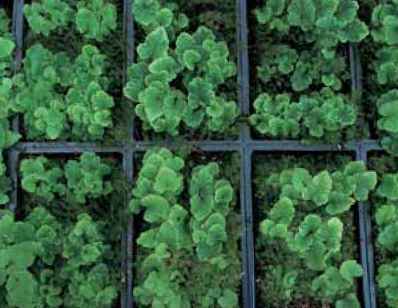 Alternating blocks of ferns and companions helps maintain varietal separation as well as helping to control pests. Irrigation is by overhead sprinklers. The large door opening and fan promote good airflow. 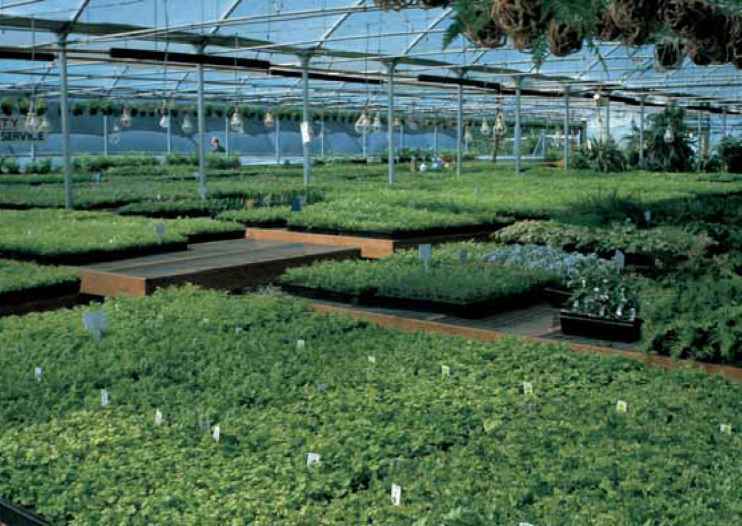 Excellent floor drainage and overall cleanliness promote plant health. Photo by Nils Sundquist, Sundquist Nursery. Time frames vary, of course, depending on the propagation situation, but all apog-amous (growing without the sexual generation) species develop with speed. Many dryopteris, cheilanthes, and cyrtomiums are included in this group and even their nonapogamous species are among the best for hurried rewards. 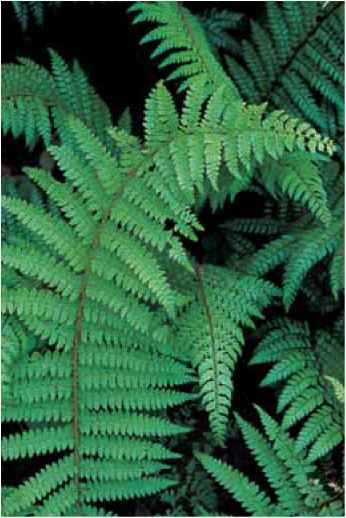 Arachniodes, athyri-ums, aspleniums, and certainly doodias and pteris are a sampling of reliable choices for reaching respectability in 12 to 18 months. Polystichums are erratic, ranging from prompt to reliable but long-term, and blechnums are slow. As with any system, there are, of course, potential problems. In spite of precautions, algae or molds may develop on the surface of the culture, especially when there are only a few prothalli rather than a solid covering. A light application of diluted fungicide (the old standby captan is fine) can bring this under control. Fungus gnats are obnoxious, but not fatal. They can be recognized by their flight pattern, which generally centers around your eyes and nose, not unlike the nighttime mosquito that finds your ear. A light spray with an insecticide keeps them under control. 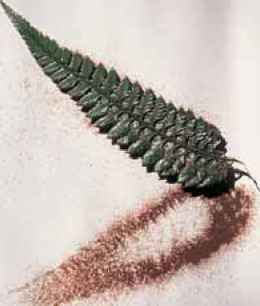 As mentioned earlier, oil-based sprays are not appropriate for ferns, and I have also had disasters with soap-based formulas. Resmethrin, which is a component of many commonly available commercial products, is a safe and effective option that will also control aphids and a number of other pests.